Motherwell extended their unbeaten run to seven matches with a deserved victory over Hibernian. The visitors played most of the match with 10 men, Liam Miller dismissed on 32 minutes for a foul on Jim O'Brien. The hosts had earlier been denied an opener when goalkeeper Graham Stack saved well from Giles Coke's shot. Keith Lasley had an effort cleared off the line for the home side before Jamie Murphy volleyed home the winner eight minutes from the end. Hibs' third successive loss means that they now sit eight points behind second-placed Celtic in the Scottish Premier League, while fifth-place Motherwell open up a seven-point gap on Hearts, who face Hamilton on Sunday. It was the Steelmen who had the game's first attempt at goal, John Sutton stealing the ball from John Rankin before firing into the arms of keeper Stack. The home side continued to dictate play and Coke's shot deflected off team-mate Murphy, forcing Stack to tip wide. Referee Euan Norris awarded an indirect free-kick inside the Motherwell penalty area after goalkeeper John Ruddy had picked up what was adjudged to be a pass-back from Stephen Craigan. The hosts complained, but it mattered little in the end as John Rankin teed up Anthony Stokes to blaze over the crossbar. Miller saw red following a rash tackle on O'Brien and, after the Motherwell player reacted angrily, both sets of players became involved in a hostile exchange, with O'Brien himself eventually booked. Hibs' Alan Gow turned well on the edge of the box and swept a shot towards goal and Ruddy leapt to his right claim the ball minutes before the break. Murphy ghosted in behind the Hibs defence to meet a Tom Hateley cross early in the second half but the forward could not convert from a tight angle. Referee Norris then denied Motherwell's claims for a penalty after Rankin's challenge on Murphy. Motherwell continued to probe and Stack had a nervous moment when he fumbled Sutton's header out for a corner. A slip by Hibs' Patrick Cregg let Lasley in on goal but the midfielder's flick towards goal was cleared off the line by David Wotherspoon. But Motherwell finally broke Hibs' resistance when O'Brien's cross was cushioned into the path of Murphy, who slammed the ball into the far corner. More uncertainty in the Hibs defence almost gifted Motherwell a second but Sutton was unable to take advantage of Rankin's short chested pass-back to Stack. Substitute Merouane Zemmama's free-kick was deflected wide of the Motherwell goal and, from the resulting corner, Chris Hogg's header was claimed by Ruddy. Murphy skilfully evaded Lewis Stevenson before playing a teasing low ball towards O'Brien, who was inches away from making a scoring connection. 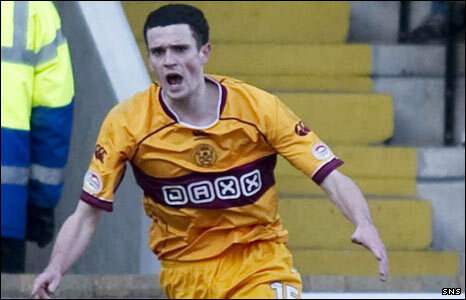 A tame effort from Murphy went straight to Stack as Motherwell finished in the ascendancy. 90:00+2:05 The referee ends the match. 90:00+1:39 Jamie Murphy takes a shot. Save made by Graham Stack. 89:10 Free kick awarded for a foul by John Sutton on John Rankin. Free kick taken by Graham Stack. 88:33 Chris Humphrey concedes a free kick for a foul on Ian Murray. Ian Murray restarts play with the free kick. 87:47 Corner taken right-footed by Merouane Zemmama, Chris Hogg takes a shot. Save by John Ruddy. 86:35 Unfair challenge on Merouane Zemmama by Steve Jennings results in a free kick. Merouane Zemmama takes the free kick. 83:53 Corner from right by-line taken by Merouane Zemmama. 83:17 Free kick awarded for an unfair challenge on John Rankin by Steve Jennings. Direct free kick taken by Merouane Zemmama. 81:18 The assist for the goal came from John Sutton. 81:18 GOAL - Jamie Murphy:Motherwell 1 - 0 Hibernian Jamie Murphy fires in a goal from inside the penalty box to the bottom right corner of the goal. Motherwell 1-0 Hibernian. 77:07 Alan Gow has an effort at goal from outside the area which goes wide left of the target. 74:56 Substitution Merouane Zemmama is brought on as a substitute for Patrick Cregg. 74:20 Inswinging corner taken right-footed by Tom Hateley from the right by-line to the near post, Mark Reynolds has a headed effort at goal from close range which goes wide of the left-hand post. 70:42 Foul by Chris Hogg on Jamie Murphy, free kick awarded. Stevie Hammell crosses the ball from the free kick left-footed from left wing, clearance by John Rankin. 69:52 Foul by Stephen Craigan on Anthony Stokes, free kick awarded. Graham Stack takes the direct free kick. 68:02 Stevie Hammell takes a outswinging corner. 65:39 Lewis Stevenson challenges Jamie Murphy unfairly and gives away a free kick. Tom Hateley produces a shot on goal direct from the free kick. 63:26 Outswinging corner taken by Tom Hateley, save by Graham Stack. 62:22 Substitution (Motherwell) makes a substitution, with Chris Humphrey coming on for Giles Coke. 60:41 Free kick awarded for a foul by Jamie Murphy on Chris Hogg. Graham Stack takes the free kick. 58:19 Jamie Murphy is ruled offside. Graham Stack takes the direct free kick. 56:39 Jim O'Brien fouled by John Rankin, the ref awards a free kick. Stevie Hammell takes the direct free kick. 55:03 Tom Hateley fouled by John Rankin, the ref awards a free kick. Free kick taken by John Ruddy. 52:43 Souleymane Bamba concedes a free kick for a foul on John Sutton. Tom Hateley delivers the ball, John Sutton takes a shot. Save by Graham Stack. 48:00 The referee penalises Giles Coke for handball. Ian Murray restarts play with the free kick. 46:49 Jamie Murphy produces a volleyed right-footed shot from deep inside the penalty box which goes wide of the right-hand upright. 46:17 Tom Hateley takes the outswinging corner, clearance made by Chris Hogg. 45:00+1:10 The referee calls an end to the first half. 43:52 John Sutton gives away a free kick for an unfair challenge on Souleymane Bamba. Free kick taken by Graham Stack. 43:29 Alan Gow takes a shot. Save by John Ruddy. 42:40 Stephen Craigan concedes a free kick for a foul on Alan Gow. Ian Murray takes the free kick. 41:31 David Wotherspoon fouled by Mark Reynolds, the ref awards a free kick. John Rankin crosses the ball in from the free kick. 40:30 Ian Murray challenges Jim O'Brien unfairly and gives away a free kick. Tom Hateley takes the direct free kick. 37:52 The assistant referee flags for offside against Anthony Stokes. Stephen Craigan takes the direct free kick. 35:12 Stephen Craigan fouled by Alan Gow, the ref awards a free kick. Free kick taken by Stephen Craigan. 32:35 Stevie Hammell takes a inswinging corner from the left by-line played to the near post. 31:50 Tom Hateley restarts play with the free kick. 31:50 Booking Jim O'Brien goes into the book for unsporting behaviour. 31:15 Sent off Liam Miller is sent off. 30:27 Liam Miller gives away a free kick for an unfair challenge on Steve Jennings. 29:18 Free kick awarded for a foul by Souleymane Bamba on John Sutton. Free kick taken by Stephen Craigan. 28:02 Unfair challenge on Chris Hogg by John Sutton results in a free kick. Graham Stack restarts play with the free kick. 27:37 Shot from deep inside the area by Anthony Stokes goes over the bar. 25:53 John Rankin restarts play with the free kick. 24:05 David Wotherspoon challenges Giles Coke unfairly and gives away a free kick. Free kick taken by Stevie Hammell. 22:33 Jamie Murphy challenges Souleymane Bamba unfairly and gives away a free kick. Direct free kick taken by Graham Stack. 20:55 Souleymane Bamba gives away a free kick for an unfair challenge on John Sutton. Tom Hateley produces a strike on goal direct from the free kick. 20:19 Giles Coke takes a shot. Save by Graham Stack. 19:07 The official flags Anthony Stokes offside. Stevie Hammell restarts play with the free kick. 17:27 Jim O'Brien has an effort at goal from just outside the box which goes wide of the right-hand post. 8:18 John Sutton takes a shot. Save made by Graham Stack. 7:40 Unfair challenge on Steve Jennings by Patrick Cregg results in a free kick. Free kick taken by Stevie Hammell. 5:20 Stevie Hammell concedes a free kick for a foul on Patrick Cregg. Chris Hogg takes the direct free kick. 3:44 Unfair challenge on Jim O'Brien by Lewis Stevenson results in a free kick. Stephen Craigan takes the free kick. 1:41 Tom Hateley takes a outswinging corner to the near post, clearance by John Rankin. 1:17 Free kick awarded for a foul by Liam Miller on Giles Coke. Free kick taken by Stevie Hammell.